We describe IBEX, an open-source tool designed for medical imaging radiomics studies, and how to use this tool. In addition, some published works that have used IBEX for uncertainty analysis and model building are showcased. Ger, R. B., Cardenas, C. E., Anderson, B. M., Yang, J., Mackin, D. S., Zhang, L., Court, L. E. Guidelines and Experience Using Imaging Biomarker Explorer (IBEX) for Radiomics. J. Vis. Exp. (131), e57132, doi:10.3791/57132 (2018). 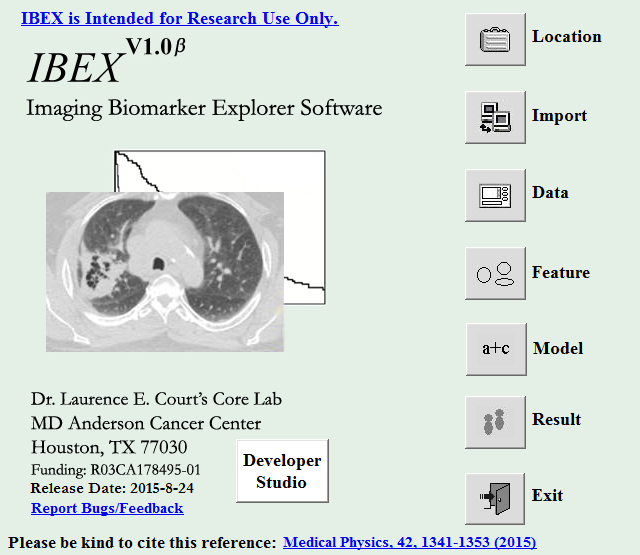 Imaging Biomarker Explorer (IBEX) is an open-source tool for medical imaging radiomics work. The purpose of this paper is to describe how to use IBEX's graphical user interface (GUI) and to demonstrate how IBEX calculated features have been used in clinical studies. IBEX allows for the import of DICOM images with DICOM radiation therapy structure files or Pinnacle files. Once the images are imported, IBEX has tools within the Data Selection GUI to manipulate the viewing of the images, measure voxel values and distances, and create and edit contours. IBEX comes with 27 preprocessing and 132 feature choices to design feature sets. Each preprocessing and feature category has parameters that can be altered. The output from IBEX is a spreadsheet that contains: 1) each feature from the feature set calculated for each contour in a data set, 2) image information about each contour in a data set, and 3) a summary of the preprocessing and features used with their selected parameters. Features calculated from IBEX have been used in studies to test the variability of features under different imaging conditions and in survival models to improve current clinical models. In medicine, patient disease diagnosis typically incorporates a large number of diagnostic exams such as x-rays, ultrasound, computed tomography (CT), magnetic resonance imaging (MRI), and positron emission tomography (PET) scans to assist in determining the course of patient care. While physicians use these images to qualitatively assess patient's diagnosis, there may be additional quantitative features that can be extracted to guide patient care. The rationale is that these features may represent proteomic and genomic patterns expressed on the macroscopic scale1. Combining this quantitative information with the current clinical information, e.g., patient demographics, may allow more individualized patient care. This is the theory behind radiomics: feature analysis of images on a voxel level. The features typically fall into 5 main categories: gray level co-occurrence matrix, gray level run length matrix, neighborhood intensity difference matrix, histogram, and shape. A general introduction to the workflow of IBEX will help to organize data properly before starting radiomics projects utilizing IBEX. If importing DICOM images, IBEX requires that each patient have their own folder with their DICOM images. DICOM radiation structure set is optional to include in the patient folder, but is recommended instead of using the contouring platform in IBEX. To assist with importing all patients for a specific study, all patient folders can be placed into one folder together so that all data may be imported into IBEX using only one step. If importing patients from Pinnacle, it is best to have the structure set with the patient plan. As patients may have multiple image sets and plans within Pinnacle, it is best to know which image set and plan are correct before importing. If computation time is a concern, reducing the number of image slices for a patient can drastically reduce time. For example, if only the liver is of interest in a study but the patients have full body CT scans, reducing the DICOM slices to only the extent of the area of interest can shorten computation time (e.g., reducing the DICOM from 300 slices to 50 slices can take 1/6th the time). There are different tools available to perform this slice reduction, from manual to semi-automatic. NOTE: To install a source-code version go to step 1.1. Alternatively, to install a stand-alone version go to step 1.2. Go to the IBEX source-code version website3. Download the "IBEX_Source.zip" and "How_to_use.pdf" files. Look in the "How_to_use.pdf" file to find the pre-requisites to use the latest IBEX version. NOTE: IBEX works only on 32 bit and 64 bit Matlab versions 2011a and 2014b, respectively. Once the download is completed, unzip the "IBEX_Source.zip" and add the \IBEX_Source folder to the local path. NOTE: Instructions on how to add a path can be found on the software references page for "add path"26. Type "IBEXMain" in the command window to start IBEX. Go to the IBEX stand-alone version website4. If installing IBEX for the first time, go to the "Dependencies" folder and download/install the "MCRInstaller.exe," vc2005redist_x86_new.exe," and "vc2012redist_x86.exe" files. From the main page, download the "IBEX.exe," "IBEX.ctf," "IBEX.ini," and "How_to_use.pdf" files to the same folder. Look in the "How_to_use.pdf" file for the pre-requisites to use the latest IBEX version. Double click "IBEX.exe" to start IBEX. Note: The images are imported to this set location and the data for this study are stored here as well. IBEX uses the most previously applied location as the default location when re-launched. Click on the "Location" icon (Figure 1). Select user or double click "New User" to create a new user folder. If creating a new user folder, enter the name in the new window then click the "OK" button. Select the site within the selected user or double click "New Site" to create a new site folder. If creating a new user folder, enter the name in the new window then click the "OK" button. Click the "OK" button at the bottom. Click on the "Import" icon (Figure 1). Select DICOM or Pinnacle9 (Pinnacle file version 9) format by clicking on the name of the format. To import DICOM images go to step 3.3.1. To import Pinnacle9 files go to step 3.3.2. NOTE: To import patients individually go to step 3.3.1.1. To import multiple patients at once go to step 3.3.1.2. Import each patient individually by selecting the patient folder through the directory. Click on the "..." button next to the listed directory to select the patient folder that contains the DICOM images and radiation structure set DICOM file (optional). NOTE: While it is only optional to import a structure set with the patient files, it is highly recommended to do so. IBEX does have a contouring platform within it, but this is somewhat impractical for large datasets. IBEX can accommodate structure sets from commercial software platforms that are familiar contouring tools for radiation oncologists, which makes the workflow much easier. This is typically how IBEX is used in studies. Click the "Import" button on the bottom left once IBEX has finished searching the DICOM files, the Patient and Details boxes will be populated. Repeat steps 3.3.1.1.1 - 2 for each patient. Click the "Exit" button after all patients are imported. Import all patients at once by checking the 'Batch Folder' box in the top right corner. ​NOTE: All patients must have a separate folder containing their respective DICOM files. Click on the "..." button next to the listed directory to select the folder that contains all patient folders with their corresponding DICOM images and radiation structure set DICOM file (optional). Click the "Import" button. Patients will be imported sequentially. Click the "Exit" button after all patients are imported. Configure the Pinnacle Host and Database within the "\IBEX\ImportExport\ImportModule\Pinnacle9\Pinnacle9ImportMain.INI" file. Click the "Config" button before selecting Pinnacle in the import module box. Select the proper Pinnacle Host and Database. Enter the Patient MRN, Last Name, or First Name then click elsewhere in the window. Select the patient in the new window then click the "Transfer" button. Click the box of the desired image sets from that patient in the new window and click the "OK" button. Click the "OK" button in the new window that is labeled "Data successfully imported." Click on the "Data" icon (Figure 1). Click on the desired patient file to open in the "Select a patient" section of the GUI (top half). Click on the image set of the desired patient file to open in the "Select image set(s)" section of the GUI (bottom half). Click the "Open" button. Use the arrows beneath the images to scroll through the images, which are shown in the axial, coronal, and sagittal views (from left to right). Zoom in on the image by clicking on the "Zoom" button (Figure 2). Draw a box on the image plane to zoom. Right click to zoom out. Turn on localizers by selecting the "Intersection" button (Figure 2). NOTE: The lines that appear show where that slice is located in each plane. These lines move when scrolling using the arrows. Click on the "Ruler" button (Figure 2) to measure distances. Click and hold the left mouse button to measure between the two points of interest. Release the mouse to remove the measured value from the displayed area. Click on the "CT Num" button (Figure 2) to measure the value of a voxel. Click and hold the left mouse button on the voxel of interest, and the value will pop up on the left side of the GUI below the color scale. Release the mouse to remove the measured value from the displayed area. Click on the "W/L" button (Figure 2) to window/level the images. Another window will pop up. Drag the left and right sides to the desired area or manually enter the window/level in the Window and Level boxes at the bottom of the new window. Select different window/levels using the first drop down menu on the left ( Figure 2): there are 8 for CT and 1 for PET. Select different color scales using the second drop down menu on the left (Figure 2): there are 9 options to choose from. Visualize ROIs by clicking on the box next to the ROI to make it visible on the images, or click on the "On All ROIs" button to turn on all patient ROIs. Edit ROIs by clicking on the "Edit ROIs" button in the top left or in the bottom center. Select the contour to edit by clicking the box next to its name. Use the "Nudge Contours" button (Figure 3) to push contours in or out as already drawn. Adjust the size of the circle used in the box labeled "D" next to the Nudge Contours button. Remove a whole contour slice by using the "Cut Contours" button (Figure 3). Click and hold the left mouse button and draw a box around the ROI to be removed. ​NOTE: Go to step 5.4.1 to draw contours by connecting points. Go to step 5.4.2 to draw contours by free hand. Connecting Points: Use the "Draw Contours (1)" button (Figure 3) to draw a contour on each slice by clicking points around the contour where the points are connected by straight lines. Complete the ROI for that slice by clicking on the first point drawn. Free Hand: Use the "Draw Contours (2)" button (Figure 3) to draw a contour by free hand. Hold the left mouse button to draw the contour on the slice. Finish the contour on that slice by coming back to the beginning of the drawn ROI and then releasing the left mouse button. Click on the "Interpolate contours" button (Figure 3) to interpolate ROIs between slices. Click on the "Copy ROI" button to copy the ROI. Merge ROIs by selecting multiple ROIs and then clicking the "Merge ROI" button. Click the "Delete ROI" button to delete the currently selected ROI. Click "Create ROI" to create a new ROI which will cause a window will pop up. Enter the name of the ROI and click the "OK" button. Click the "Save" button. Click the "Exit" button to return to the patient viewer. Click the "Show Data Set" button to view contours in the data set. Click on the name of the data set to view. Click the "Open" button. Select patient contours using the box next to their name. Click the "Delete", "Move", or "Copy" button depending on the desired function for that contour. Close the data set window once finished viewing the data set. Select contours to add to a data set by clicking the checkbox next to their name then click the "Add to Data Set" button. Click on the name of the data set to add the contours or click the "New" button for a new data set. If New is selected, enter the name of the data set in the new window. Click the "OK" button. Click the "Import ROIs" button to import a Pinnacle version 9 .roi file if contours were not loaded during Section 3. Click the " …" button to select the file. Click the "Import" button. Click the "Export ROIs" button to export ROIs. Click the " …" button to select the directory in which exported ROIs will be placed. Click on the name of the format that is preferred for the exported ROIs. Enter anonymization information if that is preferred. Click the Export button. NOTE: The preset is for no anonymization to be performed. Click the "Exit" button to return to the list of patients and scans. Click on the "Feature" icon. Click on the "Add" button under "Step1: Preprocess". Select the preprocessing option from the drop-down menu in the new window. Click on the "i" under "Para." to select the preprocessing parameters. Click on the number under the Value column in the new window of the parameter to change it. Type in the new parameter value and click the "OK" button. Click on the "question mark" button in the upper right corner for a description of the preprocessing method and the preprocessing of specific parameters. Click the "Add" button. Select the preprocessing step and click the "Delete" button to delete undesired preprocessing steps. Select the feature category from the drop-down menu under "Step 2: Features Category:". Repeat steps for multiple categories. ​NOTE: Only one category of features can be added at a time. Different combinations of preprocessing and feature categories can be added to the same feature set if desired. Select the "GrayLevelCooccurenceMatrix25" and the "NeighborIntensityDifference25" feature categories to compute the gray level co-occurrence matrix and neighborhood intensity difference matrix, respectively, in 2.5D, which is done by computing the matrix on each slice individually and then summing all matrices together. Select the "GrayLevelCooccurenceMatrix3" and the "NeighborIntensityDifference3" feature categories to compute the gray level co-occurrence matrix and neighborhood intensity difference matrix, respectively, in 3D. Click on the "i" under "Para." for the parameters selected for that preprocessing. Click on the "question mark" button in the upper right corner for a description of the preprocessing method and the parameters. Type in the new parameter value and click the "OK" button. Click the "Test" button to view a feature category or specific feature. Click the button next to the feature or category desired. Select the data set to view the test on and click the "Open" button. Check the box next to the patients from the selected data set to view the test on and click the "Test" button. Uncheck unwanted features for the category selected; all features are selected after selecting the category. Click the word "Features:" under "Step2: Features" to uncheck all features. Click the "Add to Feature Set" button to add all selected features with selected preprocessing. Select the feature set to add features to and click the "Open" button or click the "New" button to add features to a new feature set. If creating a new feature set, enter the name of the feature set in the new window and click the "OK" button. Click the "Show Feature Set" button to view features with corresponding preprocessing techniques to view features in a feature set. Select the feature set to view and click the "Open" button or click the "New" button to create a new feature set. If creating a new feature set, enter the name of the feature set in the new window and click the "OK" button. Click on the "Show Data Set" button to view current data sets. Select the data set to view and click the "Open" button or click the "New" button to create a new data set. If creating a new data set, enter the name of the data set in the new window and click the "OK" button. Click the "Result" icon. Click on the data set to run the features under "Step 1: Data Set." Click on the feature set to run on the selected data under "Step 2: Feature Set." Click on the "View Data" button to view the selected data set. Click on the "View Feature" button to view the selected feature set. Click the "Compute&Save Result" button. Enter the file name for the results and click the "Save" button. Open the saved results file. NOTE: This is typically under C:\IBEX\DataIbex\[Selected User in Step 2.2]\[Selected Site in Step 2.3]\1FeatureResultSet_Result, unless otherwise assigned in step 8.4. Use the data from the different tabs in the desired statistical tests or model building in software. NOTE: The protocol can be paused at any time. However, it is most convenient after finishing all steps needed for a particular icon, e.g., finishing all of Section 7 which is under the Feature icon. The output from IBEX is a spreadsheet (see Figure 4) that contains 3 tabs. The "Results" tab contains the feature values for each ROI in the data set (Figure 4A). The "Data Info." tab contains information about the images taken from each ROI in the data set (Figure 4B). The "Feature Info." tab contains a comprehensive list of features used with the parameters selected for the feature category and the preprocessing used for that category of features (Figure 4C). The IBEX calculated features from medical images have been utilized in several contexts. Hunter et al. used an early version of IBEX to identify robust image features19. Fave et al. investigated the uncertainty in radiomics features of 4D CT thoracic scans collected at different respiratory phases, peak tube voltages, and tube currents9. This study found intra-patient variation to be less than inter-patient variation for most features when tube voltage and current were varied, making these factors negligible. The reproducibility of the feature from cone beam CT (CBCT) images was then evaluated using IBEX10. In this study, features calculated from lung CBCT images were found to be reproducible when the same protocol and manufacturer were used only when breathing motion was small. Image preprocessing impact on feature values was subsequently evaluated. The study showed that 39 of the 55 features studied had at least one preprocessing technique that resulted in significant stratification for overall survival using Cox proportional hazards models indicating that different preprocessing may be needed for each feature11. The uncertainty in features from perfusion CT images has also been evaluated using IBEX. Yang et al. showed that radiomics features were not dependent on time between contrast administration and CT scan, and that 86.9% of features were reproducible with an inter-session stability concordance correlations coefficient greater than or equal to 0.916. Lastly, a phantom was designed to test inter-scanner variability on a subset of features15. Texture strength was found to be the most consistent feature while busyness was found to vary the most. The radiomics features from IBEX are also often used for model building, typically looking at overall survival, local-regional control, and freedom from distant metastases. Fried et al. identified 8 radiomics features from non-small cell lung cancer (NSCLC) patients' CT scans that when implemented into a Cox proportional hazards models for overall survival, loco-regional control, and distant metastases significantly improved Kaplan-Meier stratification when compared to models that only used clinical data20. Similarly, Fave et al. found radiomics features that improved patient stratification in survival curves12. Their study used weekly CT images and calculated changes in the lung radiomics features. Calculated features in the model had four different pre-processing methods: (1) thresholding, (2) threshold and bit depth, (3) thresholding and smoothing, (4) thresholding, bit depth, and smoothing; and the best pre-processing method was chosen for each feature individually before being tested in the Cox proportional hazards models. Hunter et al. also showed that radiomics features can predict tumor shrinking in NSCLC patients while exploring different thresholds and bit depth rescale values18. PET image's radiomics features and their prognostic value have also been investigated using IBEX. Fried et al. scaled standardized uptake values (SUVs) by rounding SUVs to the nearest whole number and then subtracting the minimum SUV for that ROI from the rest13. Energy and solidity were found to statistically improve an overall survival model when included compared to the model when only conventional clinical factors were included. These two radiomics features were also found to be able to identify subgroups of patients who received a benefit or detriment from dose escalation14. Similarly, van Rossum et al. found an increase in the c-index for a clinical prediction model of pathologic complete response when including radiomics features into clinical models17. Figure 1: IBEX main home page. Main page for IBEX with icons for each section. Each of these sections are described in Sections 2 - 6. Please click here to view a larger version of this figure. Figure 2: Data selection window. GUI window is used for data selection manipulation. The window comes with buttons to alter the appearance of the images as described in steps 4.4 - 4.10. Please click here to view a larger version of this figure. Figure 3: ROI editor window. GUI window is used for ROI manipulation. The window comes with the same buttons to alter the appearance as in the data selection as well as buttons to alter the ROIs. The ROI manipulation is described in Section 5. Please click here to view a larger version of this figure. Figure 4: IBEX results worksheet. IBEX outputs three pages of information in a worksheet. The first page (A) contains the feature values for each ROI, the second page (B) contains information about the images that the ROIs were drawn on, and the third page (C) contains information about the features and preprocessing used. The outputs for this figure are from a phantom study where features were calculated using Butterworth smoothing and 8-bit depth rescaling, shown in panel C, column E, rows 5 and 6. Please click here to view a larger version of this figure. IBEX is a powerful tool for medical imaging radiomics research. It has thus far mostly been used for radiation oncology purposes in studies conducted by the MD Anderson radiomics group. IBEX allows for manipulation of ROIs and calculation of features within 5 main feature categories. The source code version of IBEX allows the user to design applications that are not already part of IBEX, such as gray level zone matrix features. The main steps involved in IBEX are the import of images, contouring of ROIs, selection of ROIs for data set, and creation of feature set. Accurate contours are necessary as features are only calculated within these areas and thus inaccurate contours will provide inaccurate feature values. Thus, any relationship found between these features calculated on inaccurate contours and outcomes will be spurious. Parameter selection for the features is also a vital step. For example, changing the step size for the gray level co-occurrence matrix can impact the features calculated from the matrix. This could depend on image type (i.e., MRI, CT, or PET), site for investigation (e.g., NSCLC vs. head and neck), and the purpose of the study (e.g., creating survival models vs. linking image features with genomics). Feature parameters should be selected based on a physical or biological reasoning, e.g., is there a reason that a step size of 4 would be biologically relevant in a co-occurrence matrix? Feature parameters can also be selected based on previous studies that have found certain feature parameters to correlate with outcomes or biological expressions. IBEX has 27 preprocessing modules and 132 features available for selection, along with allowing altering of parameters for each preprocessing module and feature category, which makes it an adaptable tool for many types of radiomics studies. There are several general limitations in radiomics research that apply when using any software. For example, image features have been shown to depend on image acquisition parameters such as voxel size and scanner15,27. A limitation of all software is that there are many parameters that can be altered for each feature and the default values may not be appropriate for the specific study. Users must be vigilant, and research previously used parameter settings for similar studies and evaluate the applicability of the settings. The quality of the contours and the inherent inter- and intra-observer variability can also affect the calculation of features. Owens et al. showed that calculated features are more robust when using auto-contouring tools28. The features calculated for radiomics studies are human-engineered features and may not fully convey the features observed by the visual perception system. In addition, these features may be highly correlated to one another creating difficulties when analyzing the results. One specific limitation of IBEX is that the current version lacks the availability to calculate wavelet features; however, our group intends to include these features in future versions. There are several alternative software platforms available for the calculation of image features25. Some advantages of IBEX include the fact that it is freely available, is well documented2, and allows users detailed control of the image feature calculations. IBEX also displays the processed patient images (e.g., after smoothing), so the user can visualize the impact of any image processing - this is useful, for example, when confirming that the preprocessing has not over-smoothed the images. Similarly, IBEX can export the actual co-occurrence matrix and intensity histograms; this can be useful when delving deeper into the image features. IBEX has been solely used for cancer studies, mostly focused on radiation therapy. However, future studies can branch out to other cancer therapies or even outside of the cancer field. For example, Kassner et al. used radiomics to predict hemorrhagic transformation in patients with acute ischemic stroke29. IBEX could also be used in radiomics studies of this type. IBEX also has continual maintenance. For example, a study by Fave et al. found that 5 features (busyness, coarseness, gray level non-uniformity, run length non-uniformity, and energy) were strongly volume dependent and corrected their formulas11. These updated formulas have been included in the updated release of IBEX. Additionally, there is a google group30 that has users post questions that other users then answer. This continual improvement of IBEX in addition to the current capabilities of IBEX and its availability make it a prime source for radiomics studies. Rachel Ger is funded by the Rosalie B. Hite Graduate Fellowship and American Legion Auxiliary Fellowship. Carlos Cardenas has been funded by the George M. Stancel PhD Fellowship in the Biomedical Sciences. The development of IBEX was funded by the NCI (R03 CA178495). Excel Microsoft Office Any version of excel should work. Matlab MathWorks Only use IBEX on 32 bit Matlab 2011a or 64 bit Matlab 2014b. Lambin, P., et al. Radiomics: extracting more information from medical images using advanced feature analysis. EJC. 48, 441-446 (2012). Zhang, L., et al. IBEX: an open infrastructure software platform to facilitate collaborative work in radiomics. Med Phys. 42, 1341-1353 (2015). IBEX Source Code. Available from: http://bit.ly/IBEXSrc_MDAnderson (2017). IBEX Stand Alone. Available from: http://bit.ly/IBEX_MDAnderson (2017). Haralick, R. M., Shanmugam, K. Textural features for image classification. IEEE Trans Syst Man Cybern. 610-621 (1973). Galloway, M. M. Texture analysis using gray level run lengths. Comp Graphics and Im Proc. 4, 172-179 (1975). Tang, X. Texture information in run-length matrices. IEEE Trans on Im Proc. 7, 1602-1609 (1998). Amadasun, M., King, R. Textural features corresponding to textural properties. IEEE Trans Syst Man Cybern. 19, 1264-1274 (1989). Fave, X., et al. Preliminary investigation into sources of uncertainty in quantitative imaging features. Comp Med Imaging Graph. 44, 54-61 (2015). Fave, X., et al. Can radiomics features be reproducibly measured from CBCT images for patients with non-small cell lung cancer. Med Phys. 42, 6784-6797 (2015). Fave, X., et al. Impact of image preprocessing on the volume dependence and prognostic potential of radiomics features in non-small cell lung cancer. Trans Cancer Res. 5, 349-363 (2016). Fave, X., et al. Delta-radiomics features for the prediction of patient outcomes in non-small cell lung cancer. Scientific Reports. 7, 588 (2017). Fried, D. V., et al. Stage III Non-Small Cell Lung Cancer: Prognostic Value of FDG PET Quantitative Imaging Features Combined with Clinical Prognostic Factors. Radiology. 278, 214-222 (2016). Fried, D. V., et al. Potential Use of (18)F-fluorodeoxyglucose Positron Emission Tomography-Based Quantitative Imaging Features for Guiding Dose Escalation in Stage III Non-Small Cell Lung Cancer. IJROBP. 94, 368-376 (2016). Mackin, D., et al. Measuring Computed Tomography Scanner Variability of Radiomics Features. Invest radiol. 50, 757-765 (2015). Yang, J., et al. Uncertainty analysis of quantitative imaging features extracted from contrast-enhanced CT in lung tumors. Comp Med Imaging Graph. 48, 1-8 (2016). van Rossum, P. S., et al. The incremental value of subjective and quantitative assessment of 18F-FDG PET for the prediction of pathologic complete response to preoperative chemoradiotherapy in esophageal cancer. JNM. 57, 691-700 (2016). Hunter, L. A., et al. NSCLC tumor shrinkage prediction using quantitative image features. Comp Med Imaging Graph. 49, 29-36 (2016). Hunter, L. A., et al. High quality machine-robust image features: identification in nonsmall cell lung cancer computed tomography images. Med Phys. 40, 121916 (2013). Fried, D. V., et al. Prognostic value and reproducibility of pretreatment CT texture features in stage III non-small cell lung cancer. IJROBP. 90, 834-842 (2014). Gan, J., et al. MO-DE-207B-09: A Consistent Test for Radiomics Softwares. Med Phys. 43, 3706-3706 (2016). Klawikowski, S., Christian, J., Schott, D., Zhang, M., Li, X. SU-D-207B-07: Development of a CT-Radiomics Based Early Response Prediction Model During Delivery of Chemoradiation Therapy for Pancreatic Cancer. Med Phys. 43, 3350-3350 (2016). Huang, W., Tu, S. SU-F-R-22: Malignancy Classification for Small Pulmonary Nodules with Radiomics and Logistic Regression. Med Phys. 43, 3377-3378 (2016). Hanania, A. N., et al. Quantitative imaging to evaluate malignant potential of IPMNs. Oncotarget. 7, 85776-85784 (2016). Court, L. E., et al. Computational resources for radiomics. Trans Cancer Res. 5, 340-348 (2016). Matlab Add path. Available from: https://www.mathworks.com/help/matlab/ref/addpath.html (2017). Zhao, B., et al. Reproducibility of radiomics for deciphering tumor phenotype with imaging. Sci Rep. 6, 23428 (2016). Owens, C., et al. Reproducibility and Robustness of Radiomic Features Extracted with Semi-Automatic Segmentation Tools. Med Phys. (2017). Kassner, A., Liu, F., Thornhill, R. E., Tomlinson, G., Mikulis, D. J. Prediction of hemorrhagic transformation in acute ischemic stroke using texture analysis of postcontrast T1-weighted MR images. JMRI. 30, 933-941 (2009). IBEX Google Forum. Available from: https://groups.google.com/forum/#!forum/ibex_users (2017).